My Place: What is the Key to Your Heart? I have a friend who is celebrating her 40th wedding anniversary. She and her husband are so still in love. It is so heartwarming to see in this day of short unstable relationships. I asked her once what the secret was, she replied flowers and dancing! Happy Anniversary, mates. So today I am imaging them dancing in their kitchen, he with flowers in his mouth, and the key to her heart is there for his taking! I am not sure that dancing would have been the key to my happiness, as I have two maybe four left feet. But flowers and laughter would have opened my heart. What would open yours? It is my birthday today and the nicest thing of all was some lovely calls from far, far away and the arrival of a wonderful cookbook on baking that I won from the Online Magazine “Sweet Living”. 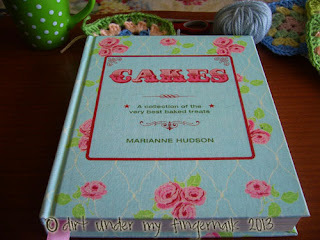 (I will blog about it on my cooking blog later on) but check it out if you are interested in crafty stuff and cooking, it has links to some amazing blogs. Have a wonderful week everyone, joining up with the wonderful creative people from Paint Party Friday, go and have a look there is some amazing art out in blogland. Happy birthday ! a super painting is this! Happy Birthday Sharon have a great day. Love the story behind the fab painting. Happy birthday Sharon! :-) A wonderful painting and lovely story of your friend! Well dancing would have been a key to my heart - but my husband doesn't dance so… he won me over with other qualities! Happy Birthday!Gorgeous art and story!Love is inspiring! Hope you're having a wonderful day Sharon! That's great that you won something and it arrives right on your birthday! I love your new blogheader, and your artwork is so vibrant and alive. Love your interpretation of their relationship. Happy birthday!! Have a super day! I love the flowers coming out of the man's mouth! What a fabulous image! It made me smile right away. This is a super piece of art. Really great with getting the message out. 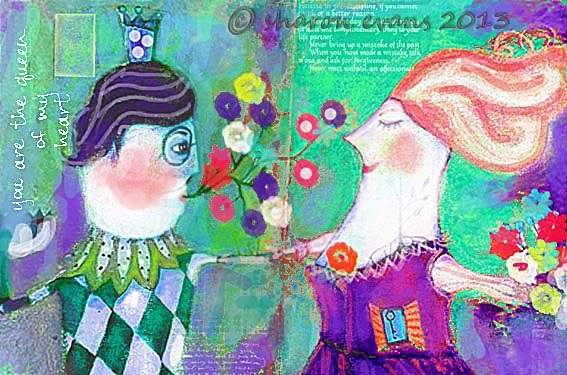 A truly lovely painting, and somehow it gives that happy feeling of a Chagall painting. What still works for us after 56 years? Laughter most certainly and shared interests. Painting so lovely I have scrolled back a few times to look again. Happy , happy birthday to you dear Sharon!! Love your painting-it also reminds me of a New year's celebration! Oh Happy Birthday Sharon, best of wishes to you! Your art is so full of color and fun! Being happy together after so many years is such a blessing, being on the same wave length is important and sharing together is what works for us. Beautiful journal page. I love that it was inspired by a happy marriage. Happy Birthday! Happy Birthday dear lady!! Hope it's wonderful. Dancing would have won me over...my ex had two left feet. Now it wouldn't matter though. Laughter is always important to me!! I love love love your couple dancing. My parents lasted a long time with dancing under their belt and they danced in the kitchen too!! No flowers were involved though...just love!! Enjoy your day! Wishing a life full of creative bliss!! lovely whimsical sketch! I must admit flowers make me happy! Lovely art and story behind it! Happy Birthday and happy PPF! Happy birthday, my husband and i have been married 29 years and the secret for us is communication! Lovely piece of art! dancing even when you have to left feet! i love this whimsy look. What a delightful tribute to your friends! Happy BIrthday Sharon! Love your painting of your dancing friends! Wonderful!